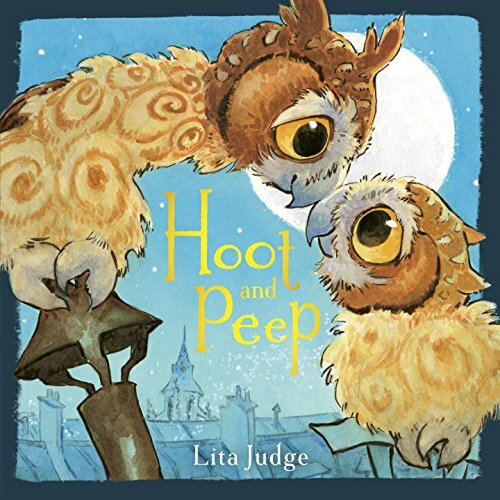 In the night skies above Paris, an adorable young owl teaches her older brother about the power of imagination—and the unconditional love between siblings Hoot the owl is very excited for his little sister, Peep, to join him on the cathedral rooftops. She's finally old enough to learn all his big brother owly wisdom: First, owls say hooo. Second, they always say hooo. Lastly, they ONLY say hooo! But why would Peep say hooo when she could say schweeepty peep or dingity dong? Why would she speak when she could sing? As she explores the breathtaking Parisian cityscape, Peep discovers so many inspiring sights and sounds—the ring of cathedral bells, the slap of waves on stone—that she can’t help but be swept up in the magic of it all. Hoot doesn’t understand Peep’s awe, until he takes a pause to listen . . . and realizes that you're never too old to learn a little something new. From the beloved author/illustrator of the classic picture book Red Sled, this gorgeous read aloud celebrates the wonder found in little things—and in the hearts of dreamers, young and old.